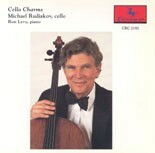 Cello Charms, Michael Rudiakov, cello & Ron Levy, piano. Works by Mozkowski, Weber, Bach, Mendelssohn, Schubert, Ravel, Rachmaninoff, et. al. Works by Mozkowski, Weber, Bach, Mendelssohn, Schubert, Ravel, Rachmaninoff, et. al.